Purchasing extra components to keep surface mount technology (SMT) production lines running is the main focus of attrition. During SMT manufacturing some components will be lost. Attrition ensures that the contract manufacturer has enough usable components to complete the job without costly machine stoppages. Attrition should be estimated by the SMT Engineering team based on experience with their equipment. Factors influencing the attrition estimate are primarily package size and component cost, and secondarily lot size Two primary elements are leader length and placement loss. For example, most SMT placement machines require a certain length of leader to feed a reel into a machine. The number of components per inch of leader impacts the attrition calculation. Also, SMT machines "lose" parts by mis-picking. Mis-picking increases as parts get smaller, more precise, and the assembly pick rate rises. Since a certain percentage of parts are expected to be to mis-picks, the amount of estimated attrition will rise with the lot size. Generally, the engineers will factor in generous levels of attrition of very small low value components in order to avoid costly line stoppages over parts costing fractions of a penny. Most expensive parts will be allowed very little attrition. 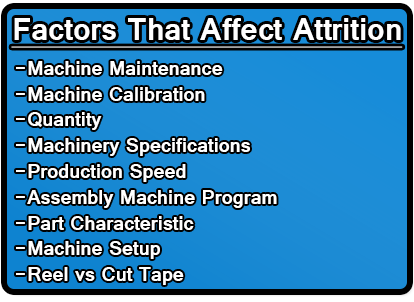 Actual attrition should be calculated based on the information provided by the company’s SMT manufacturing equipment. An important aspect of attrition is understanding how to lower the amount of extra components required in manufacturing. Utilizing reels of components rather than strips or loose bulk will allow for the lowest component loss in the pick and place machines, as well as enable you to purchase at price breaks. Additionally, proper care and calibration of the feeders and regular maintenance checkups on SMT equipment will lower the rate of component loss. The cost of attrition should be carefully weighed against the likelihood of stopping the line. Attrition costs can be high for very low volume runs of 1-10 units, expect attrition to typically run between 5-20% of material cost. Above 20 units the percentage impact of attrition typically falls rapidly to well below 1% in runs of 100 and above. If you are being presented with attrition costs above a couple tenths of a percent for volume manufacturing, you should question the charge. Note that attrition is not the same as scrap, which is an entirely different category of cost.